Virtually plotless, Lost River is a lurid technicolour nightmare featuring a senseless mishmash of shot types, a warped Miss Havisham and a caricaturish Matt Smith. There’s no subtlety here; the sparse dialogue conspicuously asserts that the American dream is a lie, and Gosling is so reliant on imagery that it’s no surprise to learn some shooting preceded writing. 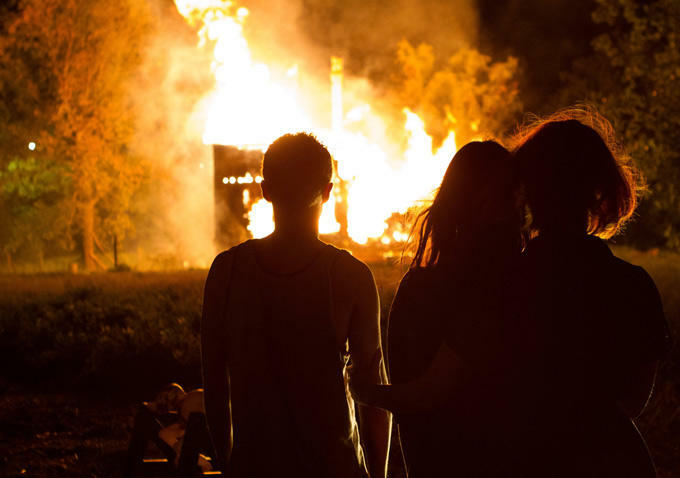 Lost River is over-burdened by Smith and Mendelsohn’s nebulous villains, and disturbingly preoccupied with gratuitous and viscerally horrifying brutal acts. The high points are Hendricks’ soulful performance and Johnny Jewel’s suitably haunting score, yet the finished product remains this side of remarkable. There’s more than a nugget of intrigue to this era-less, nihilism-inflected tale, but Gosling is too concerned with aesthetic and tone to deliver much of a narrative. Download the score or switch on Mad Men. This entry was posted in Film Reviews, Mini-reviews, One Room with a View articles and tagged Ben Mendelsohn, Christina Hendricks, Eva Mendes, Iain De Caestecker, Johnny Jewel, Lost River, Mad Men, Matt Smith, Miss Havisham, Ryan Gosling, Saoirse Ronan. Bookmark the permalink.